Healthcare systems are inherently distributed across large campus environments, making regular IT systems management complex and time consuming. 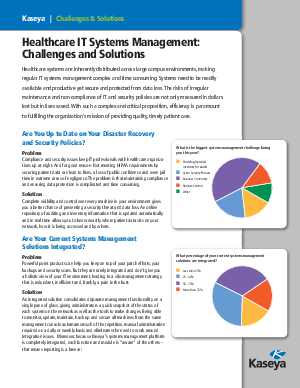 Systems need to be readily available and productive yet secure and protected from data loss. The risks of irregular maintenance and non-compliance of IT and security policies are not only measured in dollars lost but in lives saved. With such a complex and critical proposition, efficiency is paramount to fulfilling the organization’s mission of providing quality, timely patient care.